Excellence is not accomplished through complacency and mediocrity. From 2003 to 2016, the population of Red Deer increased from 72,691 to about 99,832, an increase of 37.34%. During this same period, Alberta’s inflation rate increased 29.5%. The combined growth in Red Deer’s inflation and population from 2003 to 2016 was about 66.84%. 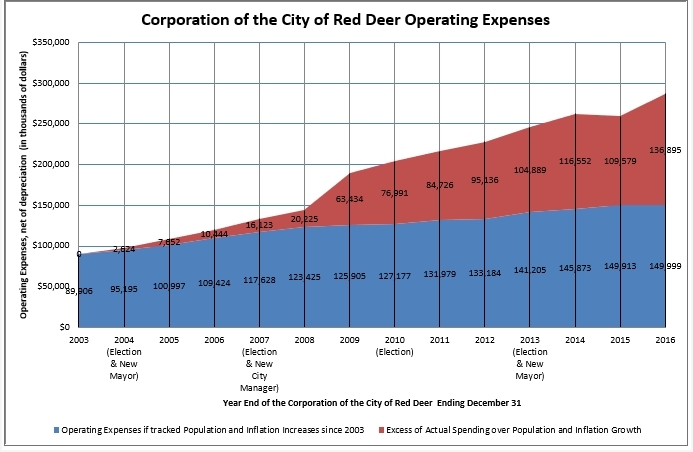 Compare this 67% increase with exponential increases in our City’s operational expenses (less depreciation) for 2003 to 2016, about $90 million in 2003 exploding to over $286 million in 2016, an increase of over 219%! The City’s operating budget for 2017 is more than $350 million! 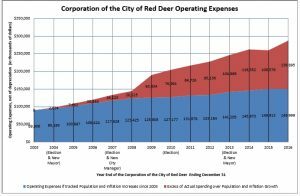 Our City is failing to bring its spending under control notwithstanding the financial realities faced by many Red Deer taxpayers. We should be able to expect our City to hold itself to similar standards of financial stewardship and responsibility as expected of taxpayer businesses and households. The area in red of more than $845 million amount partially or wholly represents inefficient use or waste of taxpayer dollars by failure to keep spending increases in line with inflation and population increases since 2003. In 2016 alone, this potential inefficient use or waste of taxpayer dollars is more than $136 million! When our City strives for excellence in its responsible use of taxpayer dollars, it makes it easier for individuals, families, and businesses in our community to do likewise. With more careful and wise use of taxpayer dollars, the City would have both more resources to make strategic capital investments which would improve the quality of life in our broader community while enabling taxpayers to pay substantially less in property taxes.